This is taken from a Jamie Oliver Cookbook. It’s pretty delicious, it’s just a commitment in terms of stove time. The alternative and highly recommended option is to throw it in your crockpot for 8 hours on slow, adding the prunes and pumpkin 5 hours in. If you need to do the stovetop edition just get a book. Mix all the spice rub ingredients together in a small bowl. Put the beef in a large bowl, and massage it with the spice rub, then cover with plastic wrap and put into the fridge for a couple of hours – ideally overnight. 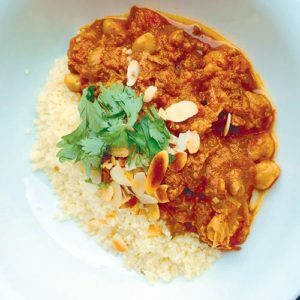 Whenever you are ready to start the tagine, heat a generous glug of olive oil in a casserole– type pan (think le creuset) and fry the meat over medium heat for 5 minutes. Add the chopped onion and cilantro stalks and fry for another 5 minutes. Add the chickpeas and tomatoes, then pour in half of the stock and stir. Bring to the boil, then put the lid on the pan or cover with foil and reduce to a simmer for 1½hours. After this eternity, add your squash, the prunes and the rest of the stock. Give everything a stir, then cover again and continue cooking for another 1½ hours. Add water or broth throughout if it dries out. When ready, check the consistency. If it seems a bit too liquid, simmer for 5 to 10 minutes more with the lid off. The beef should be really tender and flaking apart now, so have a taste and season with a pinch or two of salt. When you are ready to eat, put couscous in a pot with olive oil and sautee lightly for a few minutes. When it begins to toast, add an equal amount boiling water, cover and wait 5 minutes. Remove the lid and fluff with a fork. If you are feeling naughty add a knob of butter #yolo. 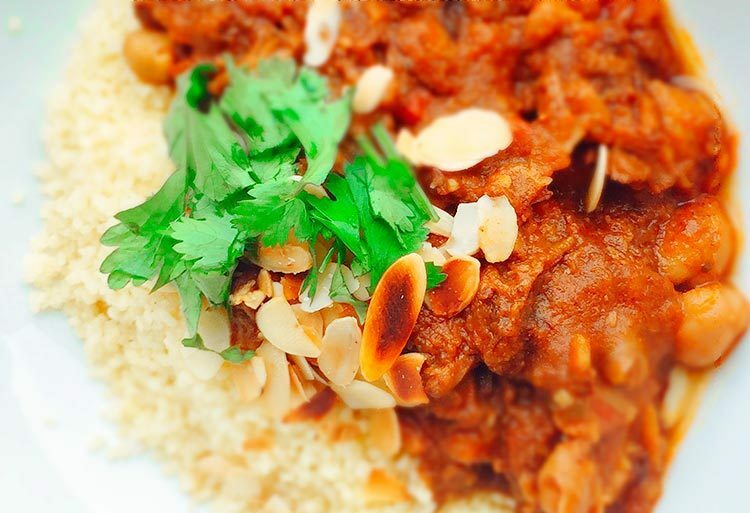 Lay the couscous out on the plate, and cover with the tagine, the cilantro leaves, and the toasted almonds.